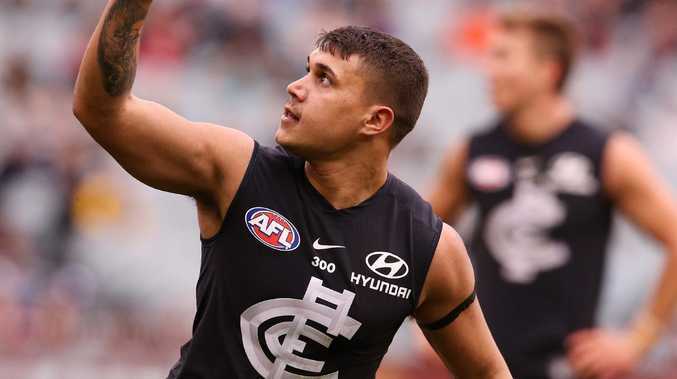 CARLTON forward Jarrod Pickett will complete extra training sessions with the Blues' VFL squad after returning to pre-season slightly overweight. Pickett has signed up for an alternate training program to get back in shape, including double training sessions. The program is being overseen by the Blues' new high-performance manager Andrew Russell, the AFL website reports. It is understood the Blues players made the tough call on Pickett, who has played 17 games since arriving at Carlton via a trade with GWS two years ago. Pickett, 22, was originally recruited by the Giants with pick FOUR in the 2014 draft. He missed a large chunk of last season with a broken wrist. Meanwhile, new Carlton co-captain Sam Docherty says he can't wait for round one next season after missing all of 2018 with a knee injury. "I didn't rule out playing at the end of last season, which got me through the year - having that hope that I could make it late in the year," he said. "I put myself in a position to play and I was probably ready to play, but we just made the decision that we may as well take out all of the risk and regroup for pre-season. "I wanted to have a full off-season to get my fitness ready for day one of pre-season. Now I'm ready to hit Round 1 and I'm starting pre-season like the rest of the boys. "I've got a good base level of fitness and I'm going to get a full three or four months in before Round 1, so I'll be ready to go."